At OSF, there’s so much more to do than plays—we also offer insightful classes, talks, and immersive discussions to complement and enrich your experience of the art on our stages. If you’re here for an afternoon, sample a demonstration or discussion at a Festival Noons or Living Ideas event. And for students and teachers, OSF’s season is packed with exciting, interactive workshops and courses specially designed to spark young minds. The heart of the OSF experience is our plays. Explore the world of this season’s works with cast lists, run times, reviews and background material to enhance your enjoyment of each play. Then find out what else OSF has to offer: free outdoor entertainment at our famous Green Show, thought-provoking discussions and demonstrations at Festival Noons and Living Ideas events, fascinating Backstage Tours and more. This years 2018 Season includes a variety of performances. Visit https://www.osfashland.org/ for a complete list of showings and pricing. The Oregon Shakespeare Festival offers a number of different pricing and buying options. 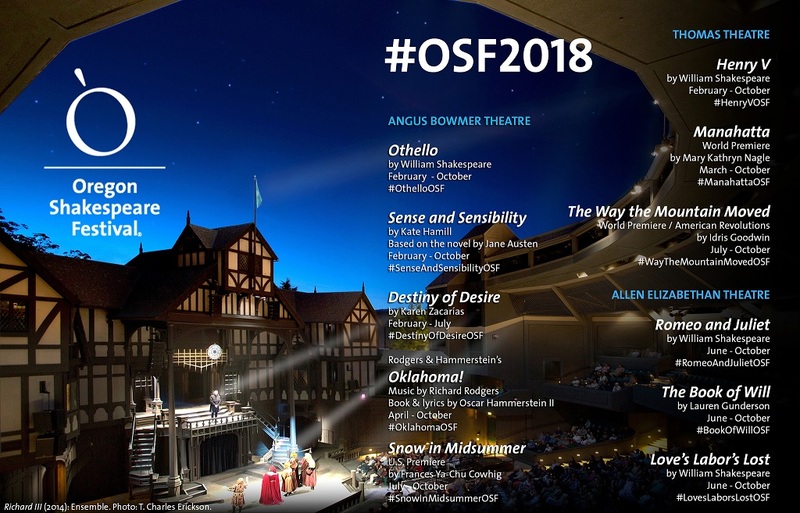 With everything from group discounts, to family days pricing and military discounts, OSF strives to make theatre an easy addition to your life. Visit the Oregon Shakespeare Festival Association website for a complete list of ticket specials.